The towers at AQUA offer your high-end clientele a truly unique Naples Lifestyle. It combines the area’s natural waterfront beauty with the perks of luxurious amenities and artfully designed residences. The marina allows for immediate access to their boats, so they can be enjoying the open waters of the Gulf of Mexico in no time! AQUA Tower II is officially 70% SOLD OUT! 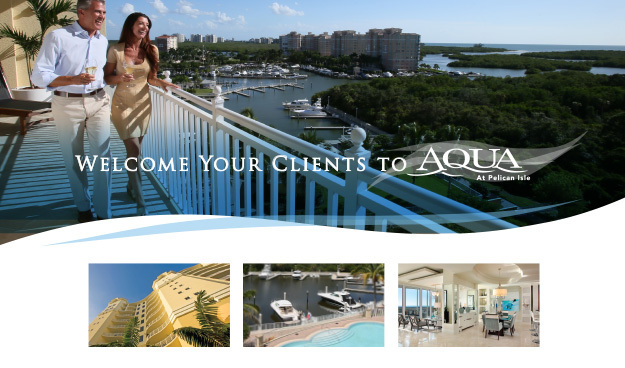 The lifestyle at AQUA is one of rare ability, filled with a host of deluxe amenities to enjoy. The world-renowned restaurants and shopping of downtown Naples are a short drive away—while the dock is nearly right outside your door.